This is a Clever Book. This is a clever book. It lets you think you’ve got it all figured out, when really you’ve only grasped a portion of what’s going on. This is the first time that I’ve ever read a book based on a screenplay that was written as a way to garner interest for said screenplay. 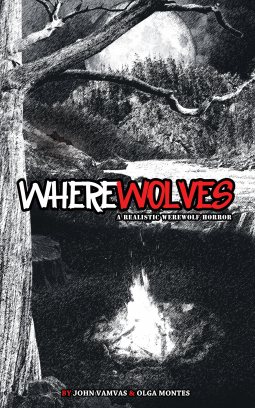 And while I have no doubt that Wherewolves could make a great movie, I prefer it as a novel. There are some interesting ideas presented here that could be completely ruined if not done properly. Thankfully, whether this movie gets made or not, we will have the story in this form. The weakest part of the book personally, was the motivations of the teacher, O’Sullivan and his brother. It spells it out for you, but it didn’t feel authentic. The thing that impressed me most was the sensation that these could all be real individuals. Everything about their motivations and reactions felt organically plausible. Except for Tim and Brian O’Sullivan. They had a purpose to serve in the story, I just would have liked it to have been hashed out a bit more. A small gripe in the grand scheme, truly. The Kindle edition says it is 306 pages long. It felt like 100. In a world where Stephen King drones on for about 100 pages too many, I was left wishing there were more pages to Wherewolves. As a reader, that’s the problem I want to have. You can get your copy and start reading today from Amazon. I highly suggest you do. ← 5 out of 5 stars Deliciously Wicked!